Somewhere in the lush jungles and plains of Africa hails a white muscleman known to the natives as Tarzan. With his strength and handsome features, Tarzan easily rose in rank among the other men of the jungle to become its self-proclaimed king and protector. Over the years, he has kept Africa's many tribesmen safe from the threat of wild animals and outsiders looking to strip the continent of its vast resources. 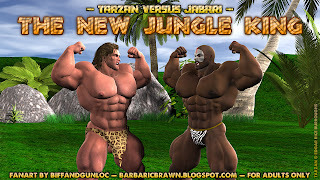 But Tarzan has also angered many of the younger, more aggressive black natives. They are jealous of his skills as a warrior, and they resent the ways in which he always manages to defeat his opponents, regardless of how high the odds are stacked against him. He prevents any tribe from gaining too much power or control, and requires the elder wise men to always come to him and ask for permission for expansion. The younger bucks consider such decisions a tribe's right to make -- not this Tarzan's. They do not consider him a son of the jungle, and with each moon that passes, their voices grow louder and more impatient for the jungle lord's downfall. One warm day, Tarzan was swinging through the trees when a little monkey came to him, screeching wildly. He watched the animal gesture emphatically toward Hatari, a dangerous mountain said to be unscalable by man. Suspicious, Tarzan thanked the creature for its information and raced toward the mountain. Tarzan spotted three men emerging from a small opening in the side of the mountain! He watched as they huddled close and mumbled to one another. He couldn't hear what they were saying, but he immediately understood its importance. He squatted low in the tall grass and watched as they sprinted off toward the new Mogu settlement he'd approved construction of only one moon ago. "Mogu men," Tarzan grunted to himself. When he was sure they'd left the area for good, Tarzan sprinted into the cavernous opening he'd seen the men leave from. It was as he'd suspected! The men had taken one of the many jewels placed in shrines said to be hidden throughout the mountain. It is said that those who find these jewels are destined for greatness and will rise in power and become leaders of the continent -- perhaps even the world itself. It is said that the very gods of Africa will bless those who possess Mt. Hatari's jewels, ensuring that these good things will come to pass. I definitely appreciate the stories to accompany your artwork. Thanks. I hope you guys like it. Like that they look to be evenly matched.